Doll☆Elements is a five piece idol group formed by Natsumi Gonda, Rika Tonosaka, Haruka Koizumi, Runa Kojima. 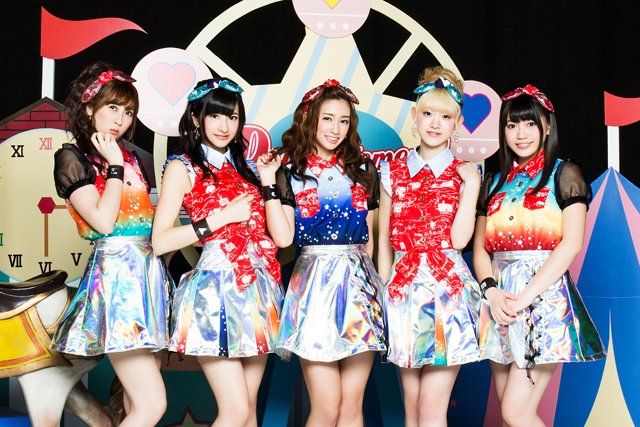 The group concept is a doll and transformation, and their sparkling pop sound draws attention from female idol fans. They are the girl next door roll model giving you the inspiration still be ing the closest . In July 2013, they made their major label debut with a single “Kimi no Heart ni Tokihanatsu”. On February 11th 2015, they released a collaboration DVD with NEO from Idoling!! !, becoming a new 12-piece idol group called Doll Neo. In June, they performed at “J Series Festival” in Jakarta, making their international debut. On August 19th they released their seventh single “Kimi no Omoi wo Todoketai”, an ending theme song for “Buzz Rhythm” on Nippon TV. In August they had solo shows in Tokyo, Nagoya and Osaka titled “DOLL PARTY”. On December 2nd, the second album “Doll Magic” was released, followed by their second national tour “Doll Magic”, performing the final at Tokyo ShibuyTSUTAYA O-EAST on December 19th. On April 13th they release their eighth single and on May 19th they had a solo show at Roppongi EX theater. They have their own regular radio show titled “Doll Raji” on TFM. In July KawaiianTV”Kawa10”, and “Doll Ele no Kimini ○○ Yarasetai”, “Doll☆Elements no Himitsu no Oshaberi Doll Bana” started at SHOWROOM, an internet live TV. Haruka Koizumi is a regular talent on a fashion trend magazine, “Tokyo Cawaii Beauty”, Rika Tonosaka and Runa Kojima are pin-up models. They are also active and drawing attention as a solo talents. They are an idol group to watch out.